Nikon D7500 review: Better than the Canon 80D? The Nikon D7500 is a cracking camera. It's up there with the most usable Nikon DSLR ever, thanks to it's fast processor, solid build, bright viewfinder and responsive tilt-angle touchscreen. 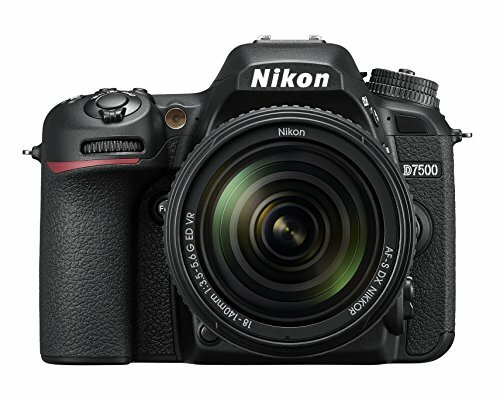 The Nikon D7500 evolves from its conventional DSLR heritage towards a more rounded user experience. This enthusiast-level DSLR packs a mighty tilt-touchscreen, Wi-Fi and Bluetooth connectivity, plus 4K video capture into its body. Oh how the times are a-changin'. For those who own older Nikon glass, the evolution may be going one step too far. The omission of the Ai indexing tab limits the D7500's compatibility with older manual focus Nikon lenses. In with the new means out with the old, we s'pose. But let's get back to the core of where the Nikon D7500 sits: it succeeds the two-year-old D7200, yet will sit in-between its predecessor and the more serious Nikon D500 in the current range. In form and features, the D7500 is very much like a crop-sensor version of Nikon's full-frame D750. With a tilt-angle screen having lacked at this mid-level in Nikon's line-up for so long, however, does the D7500 do enough to lure away from the formidable Canon EOS 80D? Let's great straight to the big improvement: the D7500 has a sizeable 3.2-inch tilt-angle touchscreen (the same as you'll find in the D500). It's bright, vibrant and the touch functionality is superb. When held alongside the Sony A6500, the D7500's screen shines by comparison. The Nikon screen is not fully articulated, so its use in portrait format is limited, but it's a very welcome improvement over the fixed screen of the D7200. Plus there are give buttons to the left of the screen, which is a rare bonus for a touchscreen camera. Perhaps the biggest surprise using the Nikon D7500 was just how much we made use of the touchscreen in preference to the viewfinder. Sure, the optical viewfinder is still there bringing all its benefits - a bright real time display with 100 per cent coverage - but, live view through that tilt-angle touchscreen is a wonder when composing landscape images. Of course, being a DSLR means the camera's AF performance in live view is no match for a mirrorless camera, so we wouldn't advise using it for action photography - you've got the viewfinder for that, which is as good as things get in APS-C DSLRs. Yet, Nikon's live view also comes up short against Canon's equivalent DSLR cameras, such as the 80D. The D7500's weather-sealed body is much the same as found in the D7200, which is a great thing because it's sturdy and sits in the hand well. There are negligible differences in size and weight. The D7500 is narrower, 45g lighter, and features a slightly deeper grip. The new camera also includes Wi-Fi and Bluetooth connectivity (there's no NFC though), which works using the SnapBridge app and - despite initial frustrations trying to work it out - has worked seamlessly for image capture and transfer to phone. It has been a novel experience to bypass using a cable release for image capture. Given the D7500 is logically higher-end than the D7200, it seems strange that the D7500 features only a single SD memory card slot. Nikon has opened itself up to criticism here because the D7100/D7200 have twin SD card slots, while the D500 has a twin SD and XQD combination. Furthermore, the D7500's SD card slot here does not support the newer and faster UHS-II type, which better supports 4K capture. Another area for criticism is that there is no vertical grip available for the D7500. There are no electronic contacts on the underside of the camera to support such a grip, so don't expect one in the future either. It seems that's now the job of the D500 to cater for such users. Nikon D7500 review: Familiar autofocus? One feature that the D7500 does not get from the D500 is its AF system. No, here it's the same 51-point AF system (with 15-cross-type-points) and AF phase detection module as found in the D7200. However, the D7500 benefits from the both the 180k RGB metering system and Expeed 5 processor as found in the D500. Given the metering and AF systems are linked, we did not expect AF performance to be the same. In particular, face recognition and subject tracking improve the accuracy of AF. As a result of these features there's faster frame-rates and a deeper buffer: shoot 8fps for 50 fames in 14-bit raw, or more than 100 full-size JPEGs. That is a solid performance these days, just not quite a class-leading one. One thing we've found particularly special is the low-light performance from the D7500's autofocus system. It's been improved over the D7200 and we think you'd struggle to find a camera at this level that performs better in low-light. Furthermore, there is the ability to fine-tune AF precision of specific lenses via live view, using the new Auto AF Fine Tune feature. We have in the past found back-focusing issues with certain Nikon camera and lens combinations, so this new feature is very welcome. A new battery type that manages power better is used in the Nikon D7500 - it's the EN-EL15a. Fortunately, the D7500 battery is forwards/backwards compatible with the EN-EL15 battery that is used in the D500, D7100 and D7200, so in terms of size it'll fit into any of those cameras. However, the D7500's battery shot-life is actually down at 950 shots, from the 1,110 shot life of the D7200 and 1,240 shot life of the D500. Those new features sure must be power hungry. Although the shot-life is down, 950 shots is around three times the amount you will get from a comparable mirrorless camera's battery like the Sony A6500. Battery life sure is when convention rules. For our D7500 test we used the Nikon 12-24mm f/4 DX lens and a Sigma 35mm f/1.4 Art FX lens. The images from the D7500 are pin sharp, especially with the latter lens. It's no surprise that the D7500 makes crisp and vibrant pictures in a variety of lighting conditions, because the camera features the same 21MP sensor without low-pass filter, as found in the D500. Though the resolution is down a fraction from the 24MP sensor of the D7200, the difference in resolution is minimal, while the improved performance in low-light is a big plus. Sensitivity from ISO 100 to ISO 51,200 can be expanded all the way up to ISO 1,640,000. Yes that is not a typo, it's a full 16-stops! Any well-exposed images taken up to ISO 800 are very sharp, while any ISO setting up to ISO 12,800 is respectably sharp. When images are viewed at 100 per cent scale, detail in shadow areas begins to display luminance noise from ISO 1600 and steadily increases up the ISO range. At ISO 25,600 detail starts to look smudged due to luminance noise and we've lost vibrancy even in well-exposed areas. It's to be expected. The extended ISO settings are novel, really. Images approaching the seven-figure ISO sensitivity are not great given the abundance of image noise. It's for the sake of grabbing headlines, we think, as we said of the D500. Colour rendition in JPEGs is as we have to come to expect from Nikon DSLRs. In good contrast light, tones are natural, though reds are often over-saturated. We found using the neutral picture setting is a good base to work from with auto white balance. Of course shooting in raw format gives greater scope for post capture corrections. Evaluative metering is very capable, too. In virtually all situations we have not had to dial in more than ±0.7 exposure compensation. The AF and metering systems are linked, so exposures for portraits are accurate in a variety of lighting conditions, even backlit, thanks to improved face recognition. All being said, the control of chroma noise is particularly top drawer at all native ISO settings. You'd be hard pressed to find a better APS-C low-light shooter at this price point. It's not all about still images, as the D7500 has added 4K video capture, too. However, there are a few restrictions in this mode that benefit from a bit of clarity. In 4K video recording mode (not in 1080p mode), there is a 1.5x crop of the D7500's APS-C sensor. When compared to full-frame, that is a 2.25x crop, which is more than 2x crop of the Micro Four Thirds (M4T) format. For wide-angle shooters this presents a problem: a full-frame 35mm lens becomes an 80mm equivalent as a result. Ideal for close-up and big close-up shots, not so great for cinematic landscapes. For uncompressed 4K UHD videos, files must be recorded directly to an external recorder via the HDMI out, while 4K files captured directly to SD card are compressed. As we said, shame there's no second SD card slot. You can select a flat picture profile and also benefit from zebra pattern to indicates the over-exposed areas in the picture, which is helpful guide for dialling down the exposure until all the highlight information is captured. When using HD video recording, the camera offers an electronic vibration reduction (VR) for smoother footage. It's no match for the in-body stabilisation found in mirrorless cameras at this price point, for instance the Sony A6500. On the flip side, there are three omissions of note: electronic contacts for a vertical grip, Ai indexing tab, and a second SD card slot. Nikon could still do with improving live view AF speed too. Most importantly, the D7500's image quality is excellent and the videos aren't half bad too. The resolution is down by a fraction from the 24MP sensors as seen in most top-end APS-C format cameras, but it's a slight decrease with excellent low-light performance in return. Overall the Nikon D7500 brings the company's mid-level range into the tilt-angle present that we've been waiting for. It's a great DSLR ambassador - even if the Canon 80D pips it to the post in terms of live view functionality. It's cheaper (though the D7500 price will come down) and has a fully articulated touchscreen, but is limited to Full HD 1080 videos. Otherwise, much of what the EOS 80D offers is on par with the D7500. We had to add in a compact system camera at the level of the D7500, it's the reality of today. The a6500 is smaller, lighter, has a superior video specification and in-body-image-stabilisation. Its images hold their own too. However, its battery life is a problem and lens choice is more limited. The other mirrorless option is the game-changing X-T2. With an additional battery grip added this is one ultra-fast shooter that also features a full articulating LCD screen.